Stepping into the Vacuum: State and Cities Act on Immigration, But Do Restrictions Work? Over the past decade, state and local policymakers have become increasingly involved in the immigration policy sphere in the United States, particularly in regard to illegal immigration. With federal immigration reform long stalled in Washington, state and local jurisdictions have stepped in to fill the gap with their own policies. The federal government has exclusive authority to set policy governing who can be admitted—or removed—from the United States. But as immigration has surged and immigrants have fanned out over the past few decades beyond the small number of traditional destination states, policymakers in state capitols and city halls have become more involved in the immigration arena. Among the factors for this increased activism: Education and health care, the two most significant costs resulting from immigration, largely fall on local and state governments even as the most significant benefits, tax payments, accrue to the federal government. Also, integration initiatives and funding are largely borne by state and local jurisdictions, and the topic of immigration has become far more public and politicized than it once was. In recent decades, most states have enacted immigration-related policies that govern access to public resources for noncitizens, in particular unauthorized immigrants. The legislative activity has also touched upon many other facets, from educational access to housing, tuition, and driver’s licenses. Slightly more than 3,000 immigration-related laws and resolutions were enacted by states between 2005 and 2015 (see Figure 1). While the effects of federal immigration policies have been widely studied, there has been less analysis of the impact of state laws, as such activity is a relatively recent phenomenon. This article assesses whether state-level laws enacted between 2005 and 2010 that seek to crack down on illegal immigration have deterred immigrants, both unauthorized and authorized, from residing in those states. An analysis by the author, building on earlier work by other scholars, finds that while restrictive state-level policies enacted during that eight-year period did not have a significant effect on the size of the overall immigrant population in a given state, there was a strong correlation with economic conditions. Some scholars have argued that state and local governments have been incentivized to seek to control aspects of immigration largely because the federal government fails to provide adequate funding and management to integrate newcomers. Although it is primarily the responsibility of the federal government to manage immigration, in practice, states and localities are at the front lines of absorbing immigrants and adapting to the social and cultural changes brought by immigration. This, combined with the lack of movement in Congress to reform U.S. immigration law or resolve the status of the 11 million people living in the country illegally, has led many state and local policymakers to seek to legislate on matters of immigration. How states engage in immigration-related policymaking is based on a number of factors, including political ones such as ideology, electoral politics, and partisanship. While states dominated by conservative constituencies have been more likely to implement restrictionist policies, such as Georgia, which enacted a law prohibiting in-state tuition for unauthorized immigrants, states with liberal majorities and/or large Hispanic populations, including California and New York, have tended to enact immigrant-friendly laws such as allowing some unauthorized immigrants with deferred action to obtain certain professional licenses. The enactment of immigration-related policies at the state level can also be the result of community concern about increasing diversity more broadly, not just growth in the foreign-born population. States with a growing share of Latinos, whether immigrant or not, are more likely to enact restrictive immigrant-focused laws, according to a 2016 study by Vickie Ybarra and two fellow researchers at the University of New Mexico’s Robert Wood Johnson Foundation Center for Health Policy. Ybarra and her coauthors also found that states that experienced greater economic stressors during the Great Recession were more likely to enact restrictive immigration legislation. Studies by researchers at Georgetown University, Trinity College, and the University of Maryland found that growth of local ethnic- and racial-minority populations, combined with the political polarization of the debate surrounding immigration and negative economic perceptions, lead to greater preference for restrictionist policies. It should also be noted that states that have seen the most rapid growth in their foreign-born populations in recent decades, even those that started with small numbers, have had the strongest reactions against immigration. At the federal level, immigration legislation over the past half century or so has had profound effects on the daily realities and integration outcomes of immigrants in the United States, the results of which have been documented extensively. Some policies have granted benefits to certain immigrants, such as the Cuban Adjustment Act of 1966, which allows eligible Cuban nationals to obtain lawful permanent residence one year after arriving in the United States, or the Immigration Reform and Control Act (IRCA) of 1986, which legalized nearly 2.7 million unauthorized immigrants even as it also increased enforcement and created employer sanctions for the hiring of unauthorized workers. Meanwhile other policies have restricted access to public services for immigrants and expanded enforcement. The Illegal Immigration Reform and Immigrant Responsibility Act (IIRIRA) and the Personal Responsibility and Work Opportunity Reconciliation Act (PRWORA), both passed in 1996, resulted in significant impacts on the immigrant community, both legal and unauthorized. Among the effects of the laws: Decreased access to public services for legal immigrants, increase in the types of offenses that make a noncitizen removable, and rising enforcement at the U.S.-Mexico border and within the U.S. interior that paved the way for significantly more deportations. Restrictive policies and rising enforcement did not, however, deter illegal immigration. The unauthorized population grew from 3.5 million in 1990 to a peak of 12.2 million in 2007 before dropping to an estimated 11.1 million in 2014. Likewise, immigration legislation enacted at the state level over the past 15 years or so has resulted in a patchwork of policies that limit or expand the rights of immigrants. The number of immigration-related state laws and resolutions enacted annually increased from 39 in 2005 to 490 in 2015, according to the National Conference of State Legislatures (NCSL). Source: National Conference of State Legislatures (NCSL), “State Laws Related to Immigration and Immigrants,” various reports, updated September 1, 2016, available online. A number of states, most notably California and New York, have passed legislation expanding the rights of noncitizens and supporting their integration through policies that facilitate their access to health care, driver’s licenses, employment and housing protections, and higher education. Since 2001, 21 states—including California, Texas, New York, and Illinois—have enacted laws and other policies allowing unauthorized immigrant students to pay in-state tuition. Additionally, 12 states—including Maryland, New Mexico, Oregon, and Washington—and the District of Columbia have passed laws since 2000 allowing unauthorized immigrants to obtain driver’s licenses or driving privilege cards. More recently, California expanded eligibility for coverage under its medical assistance program (Medi-Cal) to unauthorized immigrant children, and Governor Jerry Brown signed Senate Bill 10 to formally request the federal government to allow unauthorized immigrants to buy health insurance through California’s exchange set up under the Affordable Care Act. At the same time, states have also passed laws to limit rights and benefits available to noncitizens. The most prominent of these has been Arizona Senate Bill 1070, enacted in 2010, which sought to reduce the number of unauthorized immigrants in the state by creating a range of state penalties, such as making it a crime for unauthorized immigrants to seek or obtain employment; mandating all state and local law enforcement officers verify the immigration status of any detained persons before their release; and authorizing state officers to arrest any person without a warrant if the officer had probable cause to believe the person was potentially deportable. Although the U.S. Supreme Court ruled that key parts of SB 1070 were unconstitutional, the law served as a model for other restrictive state-level immigration laws. Similarly, in 2011 Alabama passed HB 56, considered by many to be the most restrictive state immigration law. The law required police officers to arrest those suspected of being in the country without authorization, banned landlords from renting to unauthorized immigrants, and made it obligatory for schools to verify the legal status of students, among other provisions. Within two years of its passage, the most far-reaching elements of the law had been ruled unconstitutional by the federal courts. Beyond debating and enacting their own laws, state and local jurisdictions have become more active in recent years in challenging federal policies on immigration, particularly surrounding illegal immigration. The tension between Washington and localities can be seen in the debate surrounding “sanctuary city” policies in jurisdictions that have imposed limits on local law enforcement cooperation with federal immigration authorities. Four states (California, Connecticut, Rhode Island, and Vermont), 39 cities (including Los Angeles, Chicago, and New York), and 364 counties had adopted policies of this nature as of September 2016, according to the Immigrant Legal Resource Center. These policies cropped up over the past decade in response to efforts by the Department of Homeland Security (DHS) to leverage state and local law agencies in the enforcement of federal immigration laws, most prominently under the Secure Communities federal-state information-sharing program. Amid rising reluctance of communities across the country to cooperate with federal authorities on immigration, DHS replaced Secure Communities with a more targeted Priority Enforcement Program and has been working to bring these jurisdictions back into the fold. Pushback against Washington policies is also evident in the decision by 26 states to sue the federal government over Obama administration executive actions seeking to offer relief from deportation to several million unauthorized immigrants. The lawsuit went all the way to the Supreme Court, which issued a split decision that left a lower-court injunction in place blocking implementation of the Deferred Action for Parents of Americans and Lawful Permanent Residents (DAPA) program and expansion of the existing Deferred Action for Childhood Arrivals (DACA) program. Whether explicitly stated—as in the Alabama case, where the chief sponsor of HB 56 said the legislation was “designed to make it difficult for them [unauthorized immigrants] to live here so they will deport themselves”—or not, the purpose of much restrictive state-level immigration policymaking is to deter unauthorized immigrants from remaining or settling within state lines. The question then arises: How effective have these policies been? An analysis by the author examines whether state immigration laws enacted between 2005 and 2010 had an effect on the share of immigrants in a particular state from 2005 to 2012. This study analyzes the effect that the laws had two years after the end of data collection to allow for implementation and diffusion, particularly for those enacted in 2010. This also allows time for potentially affected populations to assess risks, costs, and benefits of moving out of their state of residence. Immigration policy experts have previously studied what motivates states to enact restrictive immigration policies. The author’s study, however, was among the first to examine whether immigrants react to such laws by leaving or remaining. To examine this relationship, this study uses data from the Pew Research Center on the percentage change of the overall foreign-born population, as well as the unauthorized subset, from 2005 through 2012. The study analyzes both the overall and unauthorized immigrant populations because some restrictive laws, though targeted at unauthorized immigrants, have spillover effects on the broader foreign-born population or people who appear if they might be foreign born, as well as because in some cases, they directly address the treatment of certain lawfully present noncitizens, such as migrants with work visas and their dependents. The study omits consideration of seven states (Maine, Montana, North Dakota, South Dakota, Vermont, West Virginia, and Wyoming) where Pew found the size of the unauthorized population in 2005 was statistically insignificant. This study also uses the previously mentioned 2016 study by Ybarra and colleagues at the University of New Mexico. In order to examine the potential correlation of economic and demographic factors in a given state with the likelihood of enacting restrictive legislation, the authors collected and coded state immigration laws based on data from the NCSL Immigrant Policy Project database, categorizing each as neutral, immigrant-friendly, or restrictive. Ybarra and her coauthors exclusively focused on legislation that became law, ignoring resolutions as well as bills that did not pass or were vetoed. Of the 868 policies studied between 2005 and 2010, 441 were classified as restrictive (with an additional 423 as immigrant-friendly, and four as neutral). The states that enacted the most restrictive laws during this period were Arizona, Colorado, Georgia, Utah, Virginia, and Tennessee, with more than 20 each. The states with the fewest restrictive laws were Alaska, Connecticut, Delaware, Massachusetts, Ohio, Vermont, and Wisconsin, each with two or fewer. Source: Data provided by Vickie Ybarra, Lisa Sanchez, and Gabriel R. Sanchez, “Anti-immigrant Anxieties in State Policy: The Great Recession and Punitive Immigration Policy in the American States, 2005-2012,” State Politics & Policy Quarterly 16 no. 6 (2016): 313-39. To control for economic factors, the author’s study used U.S. Census Bureau data on two variables: 1) the percentage change of the median household income of each state between 2005 and 2012, and 2) the percentage change of the population living below the federal poverty level by state over the same period. To control for the political ideology of each state, the study used government ideology scores from Berry et al, which are based on policy preferences of elected officials and the public opinion of residents in the state, along with rankings of members of Congress based on particular votes monitored by advocates, outside organizations, political parties, and government institutions. The results of a multiple regression analysis by the author using data from the Census Bureau and Ybarra study, show that restrictive state immigration laws do not have a statistically significant correlation with the percentage change of the unauthorized immigrant population or the overall immigrant population. However, the economic variable measured—median household income—had a positive and significant correlation with the percentage change of both the overall immigrant population and the unauthorized immigrant population alone (see Table 1). The results indicate that an increase of 1 percentage point in the median household income of a state is correlated with a 0.739 percent increase in the overall immigrant population of a given state and a 1.699 percent increase in the unauthorized immigrant population. On a larger scale, the results suggest that a 10 percentage point increase in the median household income of a state would correspond to a 7.39 percent increase in the overall immigrant population and a 16. 99 percent increase in the unauthorized immigrant population. These results suggest that economic conditions have a greater effect on the size of the unauthorized immigrant population than the overall foreign-born population. Thus, while restrictive state immigration laws did not have a significant effect on the size of the immigrant population, economic factors had a significant, positive effect on the share of immigrants residing in a particular state. States with higher median incomes were more likely to see growth in their overall immigrant population over this period, regardless of whether they had enacted restrictive immigration legislation. Notes: The overall immigrant population and the unauthorized subset, as well as the median household income of states, are measured as a percentage change from 2005 to 2012. The analysis of the overall immigrant population contains 50 units, one for each state; the unauthorized subset contains 43 states, as the Pew Research Center found that the size of the unauthorized immigrant population of seven states (Maine, Montana, North Dakota, South Dakota, Vermont, West Virginia, and Wyoming) in 2005 was statistically insignificant. The constant is estimated by omitting predictors from the regression analysis; in this case, a state with no restrictive policies, no change in median household income, and a state ideology of zero (absolutely conservative) would have an increase of 2.599 percent in the overall immigrant population and 9.210 percent in the unauthorized immigrant population from 2005 to 2012. With the surge in immigration legislative activity at the state level over the past 15 years, it is important to analyze the demographic consequences of such policies. Unsurprisingly, the author’s work shows foreign-born populations, both authorized and unauthorized, seek to maximize economic and personal gains when migrating. This finding is especially relevant given that in 2008 and 2009, the United States went through a recession that severely affected federal, state, and local economies. Ybarra and her coauthors suggest that the profound economic effects of the Great Recession were partially responsible for the enactment of restrictive immigration-related policies. The author’s study finds that economic conditions themselves, rather than the restrictive immigration-related legislation that arose during this period, are the main predictor for changes in the immigrant population of individual states, even after the end of the recession. The fact that the enactment of restrictive immigration-related legislation did not have a significant effect on the share of immigrants residing in particular states could also be related to factors beyond the scope of this study. Limited implementation of the laws could be one such factor; political scientists have suggested that the degree of implementation of a policy is equally as important as its formulation and enactment. Another reason could simply be that the public, specifically the foreign-born population, was not aware of the advent of restrictive policies, perhaps due to political disengagement or lack of access to or awareness of the media coverage. While Arizona SB 1070 attracted enormous national media attention, other, smaller bills could have gone unnoticed. Future research should assess the implementation of these laws and the level of public awareness and knowledge of these measures. Although the size of the unauthorized population has leveled off, and indeed fallen, since 2007, states and municipalities continue to advance restrictive immigration-related policies. Given the increased polarization of immigration at the national level, it appears likely that, barring a federal immigration overhaul, states and cities will continue to fill the policy gap with their own laws and resolutions. Berry, William D., Richard C. Fording, Evan J. Ringquist, Russell L. Hanson, and Carl Klarner. 2010. Measuring Citizen and Government Ideology in the American States: A Re-appraisal. State Politics & Policy Quarterly 10 (2): 117-35. Boushey, Graeme and Adam Luedtke. 2011. Immigrants across the U.S. Federal Laboratory: Explaining State-Level Innovation in Immigration Policy. State Politics & Policy Quarterly 11 (4): 390-414. Brewer, Jan. 2010. Remarks by Arizona Governor during signing of SB 1070 legislation. Los Angeles Times, April 23, 2010. Available online. Burns, Peter, and James G. Gimpel. 2000. Economic Insecurity, Prejudicial Stereotypes, and Public Opinion on Immigration Policy. Political Science Quarterly 115 (2): 201-25. California Department of Health Care Services. 2015. SB 75 - Medi-Cal for All Children. Updated November 17, 2015. Available online. Chishti, Muzaffar and Faye Hipsman. 2013. As Congress Tackles Immigration Legislation, State Lawmakers Retreat from Strict Measures. Migration Information Source, May 23, 2013. Available online. Fix, Michael and Jeffrey Passel. 1999. Trends in Non-citizens and Citizens' Use of Public Benefits Following Welfare Reform: 1994-97. Washington, DC: Urban Institute. Available online. Fix, Michael and Wendy Zimmermann. 1999. All Under One Roof: Mixed Families in an Era of Welfare Reform. Washington, DC: Urban Institute. Available online. Flores, Stella M. 2010. State Dream Acts: The Effect of In-State Resident Tuition Policies and Undocumented Latino Students. The Review of Higher Education 33 (2): 239-83. Fox News Latino. 2011. Alabama Governor Admits Immigration Law Must Be Retooled. Fox News Latino, December 9, 2011. Available online. Hagan, Jacqueline, Nestor Rodriguez, Randy Capps, and Nika Kabiri. 2003. 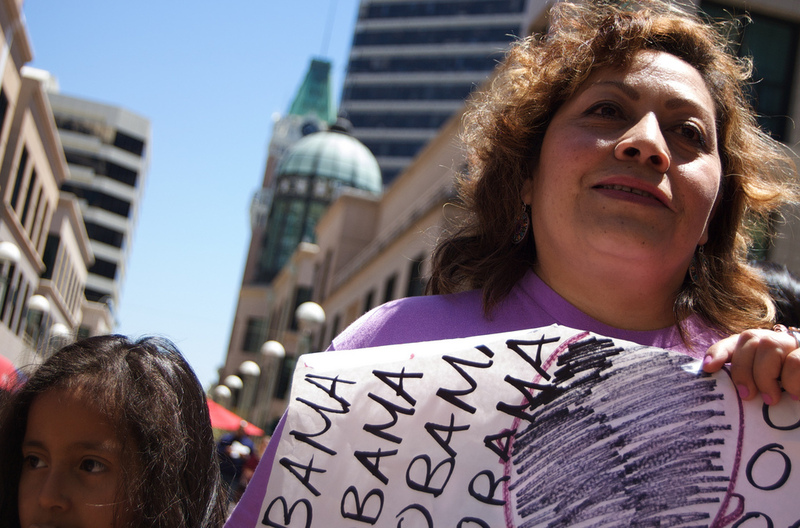 The Effects of Recent Welfare and Immigration Reforms on Immigrants' Access to Health Care. International Migration Review 37 (2): 444-63. Hopkins, Daniel J. 2010. Politicized Places: Explaining Where and When Immigrants Provoke Local Opposition. American Political Science Review 104 (01): 40-60. Karlamangla, Soumya. 2016. Gov. Brown Signs Bill that Could Help Immigrants Get Access to Health Insurance. Los Angeles Times, June 10, 2016. Available online. Lee, Jasmine, Rudy Omri, and Julia Preston. 2016. What Are Sanctuary Cities? The New York Times, September 3, 2016. Available online. National Conference of State Legislatures (NCSL). 2015. States Offering Driver’s Licenses to Immigrants. Updated July 8, 2015. Available online. ---. 2015. Undocumented Student Tuition: Overview. Updated October 29, 2015. Available online. ---. 2016. State Laws Related to Immigration and Immigrants. Updated September 1, 2016. Available online. National Immigration Law Center (NILC). 2015. Toolkit: Access to Postsecondary Education. Updated October 2015. Available online. North Carolina, Office of the Governor. 2015. Governor McCrory Signs the Protect North Carolina Workers Act. Press release, October 28, 2015. Available online. O'Connor, Brendon. 2001. The Protagonists and Ideas behind the Personal Responsibility and Work Opportunity Reconciliation Act of 1996: The Enactment of a Conservative Welfare System. Social Justice 28 (4): 4-32. Query, J. Tim and Risa Kumazawa. 2011. Examining the Impact of Issuing Driver's Licenses to Undocumented Immigrants and Other Socioeconomic Factors on the Percentage of Uninsured Motorists. Journal of Insurance Regulation 30: 265-85. Pew Charitable Trusts. 2015. U.S. Immigration: National and State Trends and Actions. Updated October 1, 2015. Available online. Pew Research Center. 2014. Unauthorized Immigrant Population Trends for States, Birth Countries and Regions. Updated December 11, 2014. Available online. Rodríguez, Cristina M. 2008. The Significance of the Local in Immigration Regulation. Michigan Law Review 106 (4): 567-642. Rosenblum, Marc R. 2015. Federal-Local Cooperation on Immigration Enforcement Frayed; Chance for Improvement Exists. Migration Policy Institute commentary, July 2015. Available online. Rosenblum, Marc R. and Ariel G. Ruiz Soto. 2015. An Analysis of Unauthorized Immigrants in the United States by Country and Region of Birth. Washington, DC: Migration Policy Institute. Available online. Skerry, Peter. 1995. Many Borders to Cross: Is Immigration the Exclusive Responsibility of the Federal Government? Publius 25 (3): 71-85. Smith, Thomas B. 1973. The Policy Implementation Process. Policy Sciences 4 (2): 197-209. Toomey, Russell B., Adriana J. Umaña-Taylor, David R. Williams, Elizabeth Harvey-Mendoza, Laudan B. Jahromi, and Kimberly A. Updegraff. 2014. Impact of Arizona's SB 1070 Immigration Law on Utilization of Health Care and Public Assistance among Mexican-Origin Adolescent Mothers and Their Mother Figures. American Journal of Public Health 104 (S1): S28-S34. U.S. Census Bureau. 2012. The Foreign-Born Population in the United States: 2010. Washington, DC: U.S. Census Bureau. Available online. Ybarra, Vickie, Lisa Sanchez, and Gabriel R. Sanchez. 2016. Anti-immigrant Anxieties in State Policy: The Great Recession and Punitive Immigration Policy in the American States, 2005-2012. State Politics & Policy Quarterly 16 (3): 313-39. Available online. Bárbara Gómez-Aguiñaga is a Health Policy Doctoral Fellow at the Robert Wood Johnson Foundation Center for Health Policy at the University of New Mexico, and a former research intern at MPI, where she provided support for the U.S. Immigration Policy Program. MPI Report: Immigration Enforcement in the U.S. The U.S. government spends more on federal immigration enforcement than on all other principal federal criminal law enforcement agencies combined, and has allocated nearly $187 billion for immigration enforcement since 1986.